Strength and conditioning coach Sal Alosi tendered his resignation from the team on January 31, 2011. In November 2010, Alosi became embroiled in controversy when he tripped Miami Dolphins' cornerback Nolan Carroll on a punt return that resulted in his suspension from the team. Former Atlanta Falcons' assistant Bill Hughan was hired as the team's new strength and conditioning coach two weeks later on February 14, 2011. Mike Bloomgren left his assistant offensive coordinator position with the team in February to become the offensive line coach and run coordinator at Stanford. Former Indianapolis Colts offensive coordinator Tom Moore was hired as an offensive consultant for the team in July 2011. The Jets signed Nick Novak on February 9, 2011 to compete with incumbent kicker Nick Folk. The Jets announced the addition of ten undrafted free agents on July 27, 2011; Josh Baker, Collin Franklin, Nick Bellore, Stafford Gatling, Michael Campbell, Dan DePalma, Courtney Smith, Tom Ottaiano, Chris Stewart, and Julian Posey. The Jets announced the addition of six undrafted free agents on July 28, 2011; Byron Landor, Davon Morgan, Zane Taylor, Taylor Boggs, Jeff Wills, and Matthias Berning. The Jets signed Chris Bryan and undrafted free agents Jeremy McGee and Jake Duron on July 29, 2011. The Jets signed Donald Strickland on July 30, 2011. The Jets signed Plaxico Burress on July 31, 2011. The Jets signed DaJuan Morgan on August 2, 2011. The Jets signed Trevor Canfield and Pete Clifford on August 4, 2011. The Jets signed Derrick Mason on August 6, 2011. The Jets signed Wilson Raynor and Keith Zinger on August 7, 2011. The Jets signed David Herron and Eddie Jones on August 9, 2011. The Jets signed Cordarol Scales on August 10, 2011. The Jets signed Aaron Maybin on August 17, 2011. The Jets signed Tracy Wilson and Nevin McCaskill on August 24, 2011. The Jets signed Isaiah Trufant on September 1, 2011. The Jets claimed Andrew Sendejo, Mardy Gilyard, Kevin O'Connell, and Colin Baxter off waivers on September 4, 2011. The Jets promoted Isaiah Trufant from the practice squad on September 10, 2011. The Jets promoted Patrick Turner from the practice squad on September 13, 2011. The Jets promoted Josh Baker from the practice squad on September 27, 2011. The Jets re-signed Aaron Maybin on September 28, 2011. The Jets promoted Eddie Jones from the practice squad on October 8, 2011. The Jets re-signed Ellis Lankster on October 11, 2011. Additionally, Martin Tevaseu was promoted from the practice squad. The Jets signed Eron Riley off the Broncos' practice squad on October 19, 2011. Shawn Nelson was signed to the Jets from Free Agency on October 31, 2011. The Jets signed Austin Howard from the Ravens' practice squad on November 25, 2011. The Jets promoted Tracy Wilson from the practice squad on November 28, 2011. The Jets signed Gerald Alexander following a season-ending knee injury to Jim Leonhard on December 13, 2011. The Jets promoted Ricky Sapp from the practice squad on December 29, 2011. The Jets released veterans Damien Woody, Kris Jenkins and Jason Taylor on February 28, 2011. The Jets released Vernon Gholston and Ben Hartsock on March 2, 2011. The Jets released Mark Brunell, Kevin O'Connell, Will Billingsley and Marlon Davis on July 29, 2011. Additionally, the Jets officially released retired quarterback Erik Ainge. The Jets released Carlos Brown on August 2, 2011. The Jets released Jerricho Cotchery on August 4, 2011. Additionally, Tom Ottaiano, Jeff Wills and Jeremy McGee were waived. The Jets released Cody Brown and waived Collin Franklin on August 7, 2011. The Jets waived DaJuan Morgan, Satfford Gatling and Carlton Powell. The Jets waived Taylor Boggs and David Herron on August 12, 2011. The Jets waived Cordarol Scales and Richard Taylor on August 17, 2011. The Jets waived Wilson Raynor, Brian Toal and Jake Duron on August 23, 2011. The Jets waived Brandon Long and Chris Stewart on August 24, 2011. The Jets waived Chris Bryan, Nick Novak and Courtney Smith on August 30, 2011. To meet the mandatory 53 man roster requirement, the Jets waived Josh Baker, Matthias Berning, Michael Campbell, Trevor Canfield, Pete Clifford, Dan DePalma, Robby Felix, Jarron Gilbert, Chris Jennings, Eddie Jones, Matt Kroul, Dennis Landolt, Byron Landor, Ellis Lankster, Joey LaRocque, Nevin McCaskill, Scotty McKnight, Davon Morgan, Julian Posey, Brashton Satele, Zane Taylor, Patrick Turner, Lorenzo Washington, Drew Willy, Tracy Wilson and Keith Zinger. The Jets waived Aaron Maybin, Isaiah Trufant and Martin Tevaseu on September 4, 2011. The Jets cut Mardy Gilyard on September 9, 2011. The Jets waived Andrew Sendejo on September 13, 2011. The Jets released Eddie Jones on October 11, 2011. The Jets waived Martin Tevaseu on October 18, 2011. The Jets waived Colin Baxter on October 25, 2011. The Jets waived Shawn Nelson on November 22, 2011. The Jets waived Emanuel Cook on November 28, 2011. The Jets waived Eron Riley on December 28, 2011. The Jets signed Josh Baker, Matthias Berning, Trevor Canfield, Jarron Gilbert, Matt Kroul, Julian Posey and Patrick Turner to the practice squad on September 4, 2011. The Jets signed Martin Tevaseu and Isaiah Trufant on September 5, 2011. The Jets signed Josh Baker and Andrew Sendejo on September 14, 2011. The Jets signed Matthias Berning and Scotty McKnight on September 21, 2011. The Jets signed Martell Webb, Michael Campbell and Julian Posey on September 27, 2011. The Jets signed Eddie Jones on September 28, 2011. The Jets signed Dennis Landolt on October 4, 2011. The Jets signed Michael Campbell and Tracy Wilson on October 12, 2011. The Jets re-signed Martin Tevaseu on October 20, 2011. The Jets signed Ricky Sapp and Jamarko Simmons and re-signed Matt Kroul and Dennis Landolt on October 31, 2011. The Jets re-signed Michael Campbell on November 1, 2011. The Jets signed Dexter Jackson on November 9, 2011. The Jets re-signed Jarron Gilbert on November 19, 2011. The Jets re-signed Eddie Jones on November 21, 2011. The Jets re-signed Ricky Sapp on November 28, 2011. The Jets re-signed Dexter Jackson on November 30, 2011. The Jets signed Mark LeGree on December 13, 2011. The Jets signed Eron Riley on December 29, 2011. The Jets released Josh Baker on September 5, 2011. The Jets promoted Isaiah Trufant to the active roster on September 10, 2011. The Jets released Matthias Berning on September 13, 2011. The Jets promoted Patrick Turner to the active roster on September 14, 2011. The Jets released Trevor Canfield and Julian Posey on September 19, 2011. Andrew Sendejo and Matthias Berning were released on September 27, 2011. Additionally, Josh Baker was promoted to the active roster. The Jets released Martell Webb and Michael Campbell on October 4, 2011. The Jets promoted Eddie Jones to the active roster on October 8, 2011. The Jets promoted Martin Tevaseu to the active roster on October 12, 2011. The Jets released Dennis Landolt on October 18, 2011. The Jets promoted Martin Tevaseu to the active roster on October 22, 2011. The Jets released Michael Campbell on October 24, 2011. The Jets released Matt Kroul on October 25, 2011. The Jets released Eddie Jones on October 31, 2011. The Jets released Jarron Gilbert on November 9, 2011. The Jets released Dexter Jackson on November 19, 2011. The Jets released Ricky Sapp on November 21, 2011. The Jets released Eddie Jones and promoted Tracy Wilson to the active roster on November 28, 2011. The Jets promoted Ricky Sapp to the active roster on December 29, 2011. The Jets traded an unconditional draft pick to the Green Bay Packers for Caleb Schlauderaff. Dwight Lowery was traded to the Jacksonville Jaguars for an unconditional draft pick. Derrick Mason was traded to the Houston Texans for an unconditional draft pick on October 11, 2011. Traded to San Diego Chargers for CB Antonio Cromartie. Traded to Philadelphia Eagles along with Draft Pick Round 6 Pick 194 for Draft Pick Round 5 Pick 153 and Round 7 Pick 227. Traded to Philadelphia Eagles along with Draft Pick Round 5 Pick 161 for Draft Pick Round 5 Pick 153 and Round 7 Pick 227. Greg McElroy QB 6 ft 2 in 222 lb Alabama From Arizona Cardinals for FS Kerry Rhodes. Traded to Detroit Lions for QB Kevin O'Connell. # Colored Throwback Titans Jerseys. Dez Bryant 3-yard pass from Tony Romo (Dan Bailey Kick) Cowboys 7–0, Drive: 9 plays, 74 yards, 4:33. Dan Bailey 34-yard field goal Cowboys 10–0, Drive: 10 plays, 47 yards, 4:47. Dustin Keller 4-yard pass from Mark Sanchez (Nick Folk Kick) Cowboys 10–7, Drive: 9 plays, 87 yards, 2:39. Miles Austin 36-yard pass from Tony Romo (Dan Bailey Kick) Cowboys 17–7, Drive: 8 plays, 73 yards, 4:40. Nick Folk 34 Yd field goal Cowboys 17–10, Drive: 10 plays, 64 yards, 4:04. Felix Jones 1-yard run (Dan Bailey Kick) Cowboys 24–10, Drive: 2 plays, 1 yards, 0:10. Plaxico Burress 26-yard pass from Mark Sanchez (Nick Folk Kick) Cowboys 24–17, Drive: 7 plays, 84 yards, 2:54. Nick Folk 50-yard field goal Cowboys 27–24, Drive: 4 plays, 2 yards, 0:22. The Jets trailed 24-10 heading into the 4th quarter. In the 4th quarter, the Jets scored 17 unanswered points preserving the win for them. With the win, the Jets started their season 1–0. NYJ Santonio Holmes 17-yard pass from Mark Sanchez (Nick Folk kick) Jets 7–0, Drive: 6 plays, 65 yards, 3:23. JAC Josh Scobee 55-yard field goal Jets 9–3, Drive: 6 plays, 20 yards, 2:52. NYJ Nick Folk 38-yard field goal Jets 12–3, Drive: 8 plays, 39 yards, 4:34. NYJ Nick Folk 45-yard field goal Jets 15–3, Drive: 4 plays, 1 yards, 0:54. NYJ Dustin Keller 11-yard pass from Mark Sanchez (Nick Folk kick) Jets 22–3, Drive: 8 plays, 92 yards, 5:18. NYJ Shonn Greene 1-yard run (Nick Folk kick) Jets 29–3, Drive: 2 plays, 1 yards, 0:38. NYJ Nick Folk 23-yard field goal Jets 32–3, Drive: 6 plays, 13 yards, 2:14. With the huge win, the Jets improved to 2–0. Darren McFadden 2-yard run (Sebastian Janikowski Kick) Raiders 7–0, Drive: 5 plays, 76 yards, 2:24. Mark Sanchez 1-yard run (Nick Folk Kick) TIE 7–7, Drive: 4 plays, 71 yards, 1:53. LaDainian Tomlinson 18-yard pass from Mark Sanchez (Nick Folk Kick) Jets 14–7, Drive: 8 plays, 79 yards, 4:11. Nick Folk 21-yard field goal Jets 17–7, Drive: 10 plays, 51 yards, 4:58. Darren McFadden 70-yard run (Sebastian Janikowski Kick) Jets 17–14, Drive: 3 plays, 85 yards, 1:23. Sebastian Janikowski 54-yard field goal TIE 17–17, Drive: 10 plays, 51 yards, 1:44. Denarius Moore 23-yard run (Sebastian Janikowski Kick) Raiders 24–17, Drive: 4 plays, 63 yards, 1:47. Michael Bush 1-yard run (Sebastian Janikowski Kick) Raiders 31–17, Drive: 2 plays, 13 yards, 0:42. Plaxico Burress 16-yard pass from Mark Sanchez (Nick Folk Kick) Raiders 31–24, Drive: 10 plays, 93 yards, 3:06. Sebastian Janikowski 49-yard field goal Raiders 34–24, Drive: 8 plays, 49 yards, 2:56. With the loss, the Jets fell to 2–1. Billy Cundiff 38-yard field goal Ravens 10–7, Drive: 9 plays, 70 yards, 5:15. Ray Rice 3-yard run (Billy Cundiff Kick) Ravens 17–7, Drive: 8 plays, 59 yards, 3:31. Billy Cundiff 38-yard field goal Ravens 20–7, Drive: 4 plays, 4 yards, 0:47. Nick Folk 40-yard field goal Ravens 27–17, Drive: 7 plays, 25 yards, 2:27. Hoping to rebound from their Week 3 road loss to the Raiders, the Jets flew to M&T Bank Stadium for a Week 4 Sunday night battle with the Baltimore Ravens. New York trailed early in the first quarter with Ravens linebacker Jameel McClain returning a fumble 6 yards for a touchdown. The Jets would respond with running back Joe McKnight returning a kickoff 107 yards for a touchdown. Baltimore would regain the lead with kicker Billy Cundiff getting a 38-yard field goal, followed by running back Ray Rice getting a 3-yard touchdown run. The Ravens added onto their lead in the second quarter with Cundiff making another 38-yard field goal, followed by linebacker Jarret Johnson returning a fumble 26 yards for a touchdown. New York responded with linebacker David Harris returning an interception 36 yards for a touchdown, followed by a 40-yard field goal from kicker Nick Folk. Baltimore came right back in the third quarter with cornerback Lardarius Webb returning an interception 73 yards for a touchdown. From there, the Ravens' defense prevented any comeback attempt. With the loss, the Jets fell to 2–2. BenJarvus Green-Ellis 3-yard run (Stephen Gostkowski Kick) Patriots 7–0, Drive: 5 plays, 64 yards, 2:34. Stephen Gostkowski 44-yard field goal Patriots 10–0, Drive: 6 plays, 18 yards, 3:06. Shonn Greene 3-yard run (Nick Folk Kick) Patriots 10–7, Drive: 13 plays, 78 yards, 7:54. Deion Branch 2-yard pass from Tom Brady (Stephen Gostkowski Kick) Patriots 17–7, Drive: 4 plays, 80 yards, 2:14. Jeremy Kerley 9-yard pass from Mark Sanchez (Nick Folk Kick) Patriots 17–14, Drive: 3 plays, 20 yards, 1:43. BenJarvus Green-Ellis 3-yard run (Stephen Gostkowski Kick) Patriots 24–14, Drive: 11 plays, 77 yards, 4:12. Stephen Gostkowski 24-yard field goal Patriots 27–14, Drive: 6 plays, 19 yards, 2:17. Santonio Holmes 21-yard pass from Mark Sanchez (Nick Folk Kick) Patriots 27–21, Drive: 11 plays, 85 yards, 5:43. Stephen Gostkowski 28-yard field goal Patriots 30–21, Drive: 13 plays, 69 yards, 6:12. With the loss, the Jets fell to 2–3. Dan Carpenter 23-yard field goal Dolphins 3–0, Drive: 7 plays, 42 yards, 2:46. Dan Carpenter 21-yard field goal Jets 7–6, Drive: 9 plays, 77 yards, 3:45. Mark Sanchez 5-yard run (Nick Folk Kick) Jets 14–6, Drive: 11 plays, 81 yards, 5:40. Nick Folk 28-yard field goal Jets 17–6, Drive: 13 plays, 79 yards, 7:16. Santonio Holmes 38-yard pass from Mark Sanchez (Nick Folk Kick) Jets 24–6, Drive: 4 plays, 50 yards, 1:37. With the win, the Jets improved to 3–3. Nick Folk 35-yard field goal Chargers 7–3, Drive: 8 plays, 64 yards, 4:46. Antonio Gates 2-yard pass from Philip Rivers (Nick Novak Kick) Chargers 14–3, Drive: 14 plays, 76 yards, 6:28. Plaxico Burress 3-yard pass from Mark Sanchez (Nick Folk Kick) Chargers 14–10, Drive: 8 plays, 77 yards, 4:53. Mike Tolbert 1-yard run (Nick Novak Kick) Chargers 21–10, Drive: 11 plays, 87 yards, 6:02. Plaxico Burress 4-yard pass from Mark Sanchez (Nick Folk Kick) Chargers 21–17, Drive: 10 plays, 55 yards, 4:33. Plaxico Burress 3-yard pass From Mark Sanchez (Nick Folk Kick) Jets 24–21, Drive: 6 plays, 19 yards, 2:15. Nick Folk 30-yard field goal Jets 27–21, Drive: 9 plays, 35 yards, 3:47. With the win, the Jets went into their bye week at 4–3. With the win, the Jets improved to 5–3. The Patriots head to MetLife Stadium for a Week 10 Sunday Night game with the Jets. The only time the Jets would lead would be in the 2nd quarter when they led 9-7 but they would get blown out in front of their home crowd 37-16. With the loss, the Jets dropped to 5-4. The second primetime game in a row for the Jets yet it was a Thursday Night game. The Jets led 13-10 with a little over a minute remaining when Broncos quarterback Tim Tebow marched his team down the field and scored the game-winning touchdown. With the heartbreaking loss, the Jets fell to 5-5 needing to desperately win some more game to qualify for the playoffs. The Jets would come out on top in a seesaw battle over the Buffalo Bills. This time the Jets scored a game-winning touchdown. With the win, the Jets improved to 6-5 continuing on the road to a playoff berth. The Jets would not lead for much of the game until the very end of the 4th quarter when they blew the game wide open. With the win, the Jets improved to 7-5. With the huge win, the Jets improved to 8-5 controlling their own playoff destiny. The Jets would be thoroughly dominated by the Eagles throughout the game. With the loss, the Jets fell to 8-6. The Jets have never beat the Eagles in franchise history. Both the Jets and Giants needed a win in order to stay in the playoff race. The Jets (8-6) hosting the Giants (7-7) would battle each other on Christmas Eve, Saturday afternoon edition. The Jets would lead 7-0 early on but the Giants would then respond and take over the rest of the game. With the heartbreaking loss for the Jets, they fall to 8-7. Hoping to keep their slim playoff hope alive, the Jets fly down to Miami for the season finale on New Year's Day. The Jets would need to win in order to make the playoffs. The Jets would lead 10-6 going into halftime. In the 2nd half, the Dolphins would score 13 unanswered points giving them a 19-10 lead. With just over a minute remaining in the 4th quarter, the Jets would score a touchdown cutting the Dolphins lead to 2. The Jets would need to convert an onside kick and score a field goal in order to win the game and head to the wild card round in Houston. Instead the onside kick goes right to the Dolphins, the Bengals have the No. 6 seed, and the Jets season ends here at an even 8-8. ^ Vrentas, Jenny (February 14, 2011). "Jets hire Bill Hughan as new strength and conditioning coach". The Star-Ledger. Archived from the original on February 14, 2011. Retrieved February 14, 2011. ^ Mehta, Manish (February 17, 2011). "Jets assistant coach Mike Bloomgren leaves to become offensive line coach at Stanford". New York Daily News. Archived from the original on March 20, 2011. Retrieved March 20, 2011. ^ Cimini, Rich (July 21, 2011). "Jets hire Tom Moore as consultant". ESPN. Archived from the original on July 25, 2011. Retrieved July 25, 2011. ^ Cimini, Rich (February 9, 2011). "Report: Jets sign kicker Nick Novak". ESPN. Archived from the original on February 9, 2011. Retrieved February 9, 2011. ^ Cimini, Rich (July 27, 2011). "Jets announce UDFA class". ESPN. Archived from the original on July 28, 2011. Retrieved July 27, 2011. ^ Cimini, Rich (July 28, 2011). "Jets announce 6 UDFA signings". ESPN. Archived from the original on July 28, 2011. Retrieved July 28, 2011. ^ a b Cimini, Rich (July 29, 2011). "Coleman bolts, Aussie punter arrives". ESPN. Archived from the original on July 30, 2011. Retrieved July 29, 2011. ^ Mehta, Manish (July 30, 2011). "Jets move on from Braylon Edwards, turn attention to Antonio Cromartie". New York Daily News. Archived from the original on July 30, 2011. Retrieved July 30, 2011. ^ Cimini, Rich (July 31, 2011). "Plaxico Burress signs with Jets". ESPN. Archived from the original on October 12, 2011. Retrieved July 31, 2011. ^ Vrentas, Jenny (August 2, 2011). "Jets sign DaJuan Morgan to add depth at safety". The Star-Ledger. Archived from the original on August 3, 2011. Retrieved August 3, 2011. ^ a b "NFL transactions for August 4, 2011". Pro Football Weekly. August 4, 2011. Archived from the original on August 7, 2011. Retrieved August 4, 2011. ^ Cimini, Rich (August 6, 2011). "Jets add WR Derrick Mason". ESPN. Archived from the original on August 6, 2011. Retrieved August 6, 2011. ^ a b Jets Media Relations Department (August 7, 2011). "Mason, 2 Others Signed, 2 Waived". New York Jets. Archived from the original on August 8, 2011. Retrieved August 8, 2011. ^ Jets Media Relations Department (August 9, 2011). "LBs Herron, Jones Come Aboard". New York Jets. Archived from the original on August 9, 2011. Retrieved August 9, 2011. ^ Vrentas, Jenny (August 10, 2011). "Jets release first official depth chart". The Star-Ledger. Archived from the original on August 11, 2011. Retrieved August 10, 2011. ^ Cimini, Rich (August 17, 2011). "Aaron Maybin signs deal with Jets". ESPN. Archived from the original on August 19, 2011. Retrieved August 17, 2011. ^ Orr, Conor (August 24, 2011). "Jets coach Rex Ryan says starters will play into second half against Giants". The Star-Ledger. Archived from the original on August 25, 2011. Retrieved August 24, 2011. ^ Vrentas, Jenny (September 1, 2011). "Jets bring back cornerback Isaiah Trufant". The Star-Ledger. Archived from the original on October 12, 2011. Retrieved September 2, 2011. ^ a b c Vrentas, Jenny (September 4, 2011). "Jets awarded four players off waivers, including QB Kevin O'Connell; Greg McElroy to IR". The Star-Ledger. Archived from the original on October 12, 2011. Retrieved September 4, 2011. 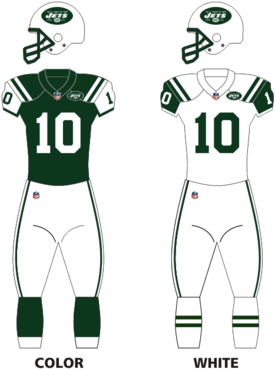 ^ a b c d e f g h i j k l m n o p q r s "New York Jets Transactions – 2011". ESPN. Archived from the original on December 28, 2010. Retrieved October 19, 2011. ^ a b "Jets re-sign Aaron Maybin". ESPN. September 28, 2011. Archived from the original on September 28, 2011. Retrieved September 28, 2011. ^ a b Jets Media Relations Department (October 11, 2011). "CB Lankster Returns, LB Jones Waived". New York Jets. Archived from the original on October 12, 2011. Retrieved October 12, 2011. ^ Vrentas, Jenny (October 19, 2011). "Jets sign WR Eron Riley off Broncos practice squad". The Star-Ledger. Archived from the original on October 19, 2011. Retrieved October 19, 2011. ^ a b c Lange, Randy (October 31, 2011). "Jets Return from Bye, Announce Transactions". New York Jets. Archived from the original on November 2, 2011. Retrieved November 2, 2011. ^ Jets Media Relations Department (November 25, 2011). "T Howard Signed to Practice Squad". New York Jets. Archived from the original on November 28, 2011. Retrieved November 27, 2011. ^ a b c d Cimini, Rich (November 28, 2011). "Curious move: Cook is cut". ESPN. Archived from the original on November 29, 2011. Retrieved November 28, 2011. ^ a b Jets Media Relations Department (December 13, 2011). "Veteran S Gerald Alexander Signed". New York Jets. Archived from the original on December 14, 2011. Retrieved December 14, 2011. ^ a b c Jets Media Relations Department (December 29, 2011). "Sapp Signed, Riley Returns to P-Squad". New York Jets. Archived from the original on December 30, 2011. Retrieved December 29, 2011. ^ Cimini, Rich (February 28, 2011). "Jets cut Damien Woody, Kris Jenkins". ESPN. Archived from the original on March 20, 2011. Retrieved March 20, 2011. ^ Cimini, Rich (July 29, 2011). "Jets release Mark Brunell". ESPN. Archived from the original on July 30, 2011. Retrieved July 29, 2011. ^ "Transactions". New York Jets. Archived from the original on August 7, 2011. Retrieved August 7, 2011. ^ Cimini, Rich (August 11, 2011). "Notebook: Rex content with TE situation". ESPN. Archived from the original on August 11, 2011. Retrieved August 11, 2011. ^ "Jets move G Brandon Moore from PUP to active roster, waive C Taylor Boggs". The Washington Post. Associated Press. August 12, 2011. Archived from the original on August 12, 2011. Retrieved August 12, 2011. ^ Zimmerman, Lisa (August 12, 2011). "Jets waive LB Herron". CBS Sports. Archived from the original on August 13, 2011. Retrieved August 13, 2011. ^ "Jets, Bills agree to terms for Aaron Maybin". Staten Island Advance. Associated Press. August 17, 2011. Archived from the original on August 17, 2011. Retrieved August 17, 2011. ^ Orr, Conor (August 23, 2011). "Jets running back Shonn Greene says foot infection is fine, expects to play against Giants". The Star-Ledger. Archived from the original on August 23, 2011. Retrieved August 23, 2011. ^ Cimini, Rich (August 24, 2011). "Sanchez doesn't mind Eli comparisons". ESPN. Archived from the original on August 24, 2011. Retrieved August 24, 2011. ^ a b c Mehta, Manish (September 3, 2011). "Jets trim roster to 53; make two trades". New York Daily News. Archived from the original on September 13, 2011. Retrieved September 3, 2011. ^ Mehta, Manish (September 9, 2011). "Sources: Mo Wilkerson fined $10,000 for fight with Brandon Jacobs; WR Mardy Gilyard cut & Trufant elevated from practice squad". New York Daily News. Archived from the original on October 12, 2011. Retrieved September 9, 2011. ^ a b Jets Media Relations Department (October 25, 2011). "Baxter Waived, Kroul Released". New York Jets. Archived from the original on October 26, 2011. Retrieved October 26, 2011. ^ Associated Press (November 22, 2011). "Jets waive backup TE Shawn Nelson because of 'non-football illness'". The Washington Post. Archived from the original on November 28, 2011. Retrieved November 27, 2011. ^ Orr, Conor (December 27, 2011). "QB Mark Sanchez doesn't anticipate status with Jets changing". The Star-Ledger. Archived from the original on December 28, 2011. Retrieved December 27, 2011. ^ a b Jets Media Relations Department (September 27, 2011). "Baker to Active Roster, Cumberland, Turner to IR". New York Jets. Archived from the original on September 28, 2011. Retrieved September 28, 2011. ^ a b Mehta, Manish (October 4, 2011). "Sources: Jets pass on OLB Tully Banta-Cain and OL Shaun O'Hara for now". New York Daily News. Archived from the original on October 8, 2011. Retrieved October 8, 2011. ^ Jets Media Relations Department (October 20, 2011). "Tevaseu Re-Signed to Practice Squad". New York Jets. Archived from the original on October 20, 2011. Retrieved October 20, 2011. ^ Vrentas, Jenny (November 1, 2011). "Jets place WR Scotty McKnight on practice squad IR with torn ACL". The Star-Ledger. Archived from the original on November 2, 2011. Retrieved November 2, 2011. ^ a b Jets Media Relations Department (November 9, 2011). "PS Moves: WR Jackson Signed, DT Gilbert Cut". New York Jets. Archived from the original on November 9, 2011. Retrieved November 9, 2011. ^ a b Vrentas, Jenny (November 19, 2011). "A look back at the Jets' 17–13 loss at Denver". The Star-Ledger. Archived from the original on November 19, 2011. Retrieved November 19, 2011. ^ a b Jets Media Relations Department (November 21, 2011). "Jones Returns in Swap of Practice Squad LBs". New York Jets. Archived from the original on November 23, 2011. Retrieved November 23, 2011. ^ Jets Media Relations Department (December 1, 2011). "WR Jackson Returns to Practice Squad". New York Jets. Archived from the original on December 1, 2011. Retrieved December 1, 2011. ^ Vrentas, Jenny (September 19, 2011). "Rex Ryan deems Nick Mangold 'very iffy' for Oakland game". The Star-Ledger. Archived from the original on September 20, 2011. Retrieved September 19, 2011. ^ Vrentas, Jenny (October 22, 2011). "Jets place WR Logan Payne on injured reserve, call up DT Martin Tevaseu". The Star-Ledger. Archived from the original on October 22, 2011. Retrieved October 22, 2011. ^ Jets Media Relations Department (October 24, 2011). "Campbell Released from Practice Squad". New York Jets. Archived from the original on October 26, 2011. Retrieved October 26, 2011. ^ "Jets trade WR Mason to Texans for undisclosed draft pick". National Football League. October 11, 2011. Archived from the original on October 12, 2011. Retrieved October 12, 2011. ^ Cimini, Rich (July 27, 2011). "Clemens agrees with Redskins". ESPN. Archived from the original on July 28, 2011. Retrieved July 27, 2011. ^ a b Vrentas, Jenny (January 26, 2011). "Jets deny Raiders permission to interview secondary coach Dennis Thurman". The Star-Ledger. Archived from the original on January 26, 2011. Retrieved January 26, 2011. ^ Vrentas, Jenny (July 29, 2011). "Nnamdi Asomugha heads to Eagles, not Jets or Cowboys". The Star-Ledger. Archived from the original on July 30, 2011. Retrieved July 29, 2011. ^ Mehta, Manish (July 31, 2011). "Jets agree to 4-year deal with Antonio Cromartie less than 24 hours after landing Plaxico Burress". New York Daily News. Archived from the original on August 7, 2011. Retrieved August 4, 2011. ^ "Braylon Edwards agrees with Niners". ESPN. Associated Press. August 4, 2011. Archived from the original on August 7, 2011. Retrieved August 4, 2011. ^ "Source: Pats to sign DE Shaun Ellis". ESPN. August 7, 2011. Archived from the original on August 7, 2011. Retrieved August 7, 2011. ^ Cimini, Rich (July 27, 2011). "Source: Jets, kicker Nick Folk agree". ESPN. Archived from the original on July 28, 2011. Retrieved July 27, 2011. ^ Cimini, Rich (February 15, 2011). "Jets franchise tag LB David Harris". ESPN. Archived from the original on February 15, 2011. Retrieved February 15, 2011. ^ Schefter, Adam (February 24, 2011). "Source: David Harris signs tender". ESPN. Archived from the original on February 24, 2011. Retrieved February 24, 2011. ^ Cimini, Rich (August 2, 2011). "David Harris signs 4-year deal with Jets". ESPN. Archived from the original on August 3, 2011. Retrieved August 3, 2011. ^ Cimini, Rich (July 27, 2011). "Sources: Jets, Santonio Holmes agree". ESPN. Archived from the original on July 27, 2011. Retrieved July 27, 2011. ^ Cimini, Rich (July 26, 2011). "Wayne Hunter agrees to deal with Jets". ESPN. Archived from the original on July 27, 2011. Retrieved July 26, 2011. ^ Howe, Jeff (August 19, 2011). "Former UMass Star James Ihedigbo Signs With Patriots". New England Sports Network. Archived from the original on August 19, 2011. Retrieved August 19, 2011. ^ Vrentas, Jenny (August 3, 2011). "Jets bring back safety Brodney Pool". The Star-Ledger. Archived from the original on August 3, 2011. Retrieved August 3, 2011. ^ "Former Jet Brad Smith jumps to division rival Bills". Sports Illustrated. Associated Press. July 28, 2011. Archived from the original on July 28, 2011. Retrieved July 28, 2011. ^ Mehta, Manish (July 30, 2011). "Jets sign Eric Smith to a three-year deal". New York Daily News. Archived from the original on July 30, 2011. Retrieved July 30, 2011. ^ Zimmerman, Lisa (July 29, 2011). "Jets sign RFA OL Turner to one-year deal". CBS Sports. Archived from the original on July 30, 2011. Retrieved July 30, 2011. ^ Vrentas, Jenny (July 29, 2011). "Giants sign Steve Weatherford, former Jets punter". The Star-Ledger. Archived from the original on July 30, 2011. Retrieved July 29, 2011.